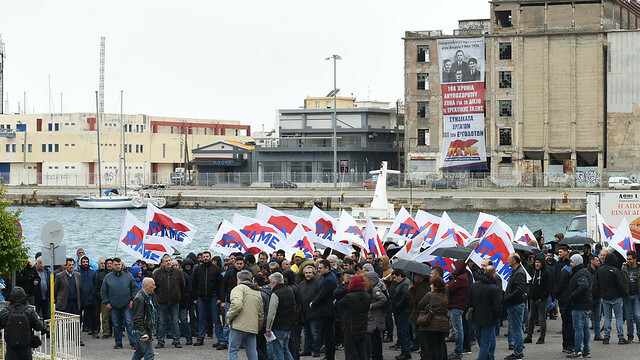 On Thursday, March 14, in the city of Kalamata, dozens of Unions and National Federations held a massive and militant protest condemning the intervention and presence of the employers inside the Unions and specifically in the GSEE Union (member of the ETUC in Greece). “Unions for the Workers-Out the Employers from the Unions” condemning the presence and participation of employers inside the GSEE and the support of the GSEE leadership to the antiworkers’ policies. Dozens of National Federations and Regional Trade Unions have condemned the antidemocratic tactics of the GSEE for its congress, with massive election fraud, participation of employers, secret police, armed bodyguards and attacks against real workers’ representatives.